India vs Australia 2019: Has the rest proved costly for Bhuvneshwar Kumar? As the World Cup 2019 gets closer, with just three months left for it to start, India have just four ODIs more to finalize their squad for the plane to England. In recent months Mohammed Shami has appeared out of nowhere to book his ticket for England and not only that, he now looks set to replace Swing King Bhuvneshwar Kumar in the probable playing XI for the first few World Cup matches. Bhuvneshwar has recently suffered a lot of injuries, which has also resulted in a loss of form. Apart from the South African series last year, Bhuvneshwar had a disastrous 2018. He played 12 ODI matches and picked up just 9 wickets in the process, with an average touching 55. In the historic Test series win against Australia, Bhuvneshwar did not play a single match due to fitness issues. 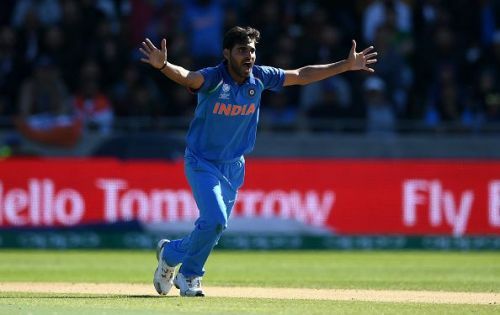 He regained his fitness and looked good against the Kangaroos in the ODI series picking up 8 wickets in just 3 matches, but at the other end, Shami too kept picking up crucial wickets which applied more pressure on the former to perform well. Shami kept improving with each passing match he played. He performed better than Bhuvneshwar in New Zealand, picking up three wickets more than him this time - and even at a better economy. Bhuvneshwar has now been rested for the first two Australian ODIs at home and Shami and Bumrah are working well for India as the new ball openers. He will be back from the third ODI onwards, and he would be hoping to make the most of the last three matches of the series. With the emergence of Vijay Shankar and the return of Hardik Pandya, Bhuvneswar has a challenge on his hands to cement his place in the playing XI. Keep in mind too that he won't be playing any ODIs between now and the World Cup. Bhuvneshwar provides a bit of batting usefulness and also some crucial death bowling skills, but he might have needed more game time to get back into the right confidence and form before travelling to England. The frequent breaks, including the periods of rest, that Bhuvneshwar has had to go through in recent times, may have ended up hurting his chances for selection rather than enhancing them. It remains to be seen if the pacer can rebound from this and become a guaranteed starter in the Indian team agin. Who should be India's second pacer at the ICC World Cup 2019 - Mohammed Shami or Bhuvneshwar Kumar? World Cup 2019: Has Mohammed Shami confirmed his place in the Indian squad for the tourney? India vs Australia 2019: Will MS Dhoni be donning the Indian jersey for the last time at his home ground?